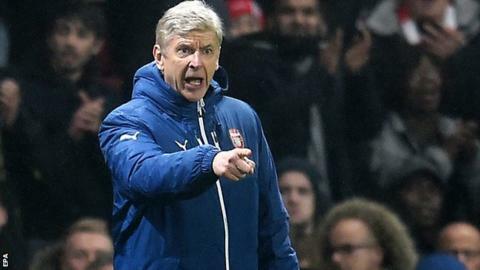 Arsenal boss Arsene Wenger believes it is up to players to "control what they say" when they publish material on social media. Wenger was speaking after Liverpool striker Mario Balotelli apologised for a post which appeared to contain anti-Semitic and racist references. "We can only warn them of the potential dangers but you cannot control a player 24 hours a day," he said. "They have to be responsible enough and educated to control what they say." He added: "The danger of social media is that you can quickly not always imagine the consequences of what you say." Arsenal play Southampton on Wednesday and Wenger has a problem at left-back with doubts over Kieran Gibbs and Nacho Monreal. "We have some question marks about Gibbs, Monreal and Alex Oxlade-Chamberlain. Everybody else looks like being available," said Wenger. "Laurent Koscielny just came back after a long time and we will see how he responds. "Goalkeeper Wojciech Szczesny is still out. Mathieu Debuchy is training. Could he be involved next week? Certainly. David Ospina as well, one week. Yaya Sanogo is all right now." Southampton manager Ronald Koeman took over at St Mary's last summer and his side lie third in the top flight, six points ahead of Arsenal. "He (Koeman) has done very well. He came without making too much noise and did the job," said Wenger. "If you look at their number of points and the number of games they have played, you have to consider them (for the top four), yes. "If they can maintain their run, yes. We'll know more about it in March. "At Christmas last season, they were in a very strong position and the fact that they could renew that, shows that they have stability in their performances. "You have to consider the fact that they don't play in Europe, so they can prepare well for every single game. That, of course, can be to their advantage." Is Thierry Henry coming back to the club? Henry, 37, was at Arsenal between 1999 and 2007 as well as for a loan stint between January and February 2012. He scored 228 goals in 377 appearances for the club and is a free agent after leaving New York Red Bulls. "What I understand is that he wants to reflect for a while on how he wants to go into his next life," said Wenger. "I met him at the age of 17 in Monaco. He is now 37 so he had 20 years of competitive football and that deserves a huge respect and congratulation, not only on what he has achieved but on his attitude. "He has the right to reflect and think of what he wants to do now. "He is an Arsenal man. The best moment of his life and career has been experienced here. "Certainly one day he will come back here. In what kind of role, I don't know. "He has to think about what kind of direction he wants to give to his next life." "He has all the qualities (to be a coach) because he is intelligent, committed and loves the game. He just has to really think if he wants to sacrifice the rest of his life to be involved in that job. "I don't think he wants to carry on playing."